Review: From World Unknown, Magic Feet and Tusk Wax and now on to Kinfolk, Tim Rivers is marking out a place in that world of mystical grooves where acid, kosmische, new age, Balearic and wyrd pagan dance can all jam to the same beat. The title track on The Mirage is a gorgeous slice of motorik smoothness, letting sustained guitar nights ring out over a tender throb of bass. 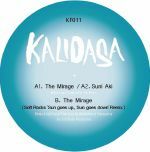 "Suni Aki" is a more dramatic piece with a healthy dose of 80s bombast poured over its loins, and then Soft Rocks grapples the B side for a remix of "The Mirage" that cuts the tow line and drifts off in the direction of the sunset.